The United States Congress designated the Lye Brook Wilderness (map) in 1975 and it now has a total of 18,122 acres. All of this wilderness is located in Vermont and is managed by the Forest Service. 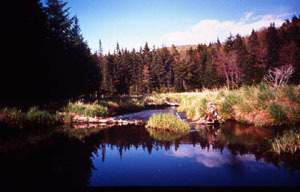 The Lye Brook Wilderness is east of Manchester Center in the southern Green Mountains of Vermont. This wilderness is named after Lye Brook, which flows through its western half. The wilderness ranges from 900 feet to 2900 feet above sea level. Most is above 2500 feet, on a high plateau with several ponds and bogs. Waterfalls and rocky streams may be found here as well as reflecting pools. The western section is extremely steep, facing west-northwest towards U.S. Route 7 and Manchester. Four and a half miles of the Appalachian/Long Trail cross the northwest tip of the wilderness. Approximately 80% of the area is forested with northern hardwoods: birch, beech, and maple. Thickets of small spruce dot the area. Remnants of railroad grades and old logging roads remain. Several species of neotropical birds, black bear, moose, deer, pine martin and bobcat inhabit these woods. There are many marshy areas off trail and the ecological balance is quite fragile. Take care and be prepared for muddy trails and an intense black fly season in the spring and early summer. Hunting opportunities for deer bring many seasonal visitors, as do snowshoeing and cross-country skiing in the winter months. Planning to Visit the Lye Brook Wilderness? How to follow the seven standard Leave No Trace principles differs in different parts of the country (desert vs. Rocky Mountains). Click on any of the principles listed below to learn more about how they apply in the Lye Brook Wilderness.